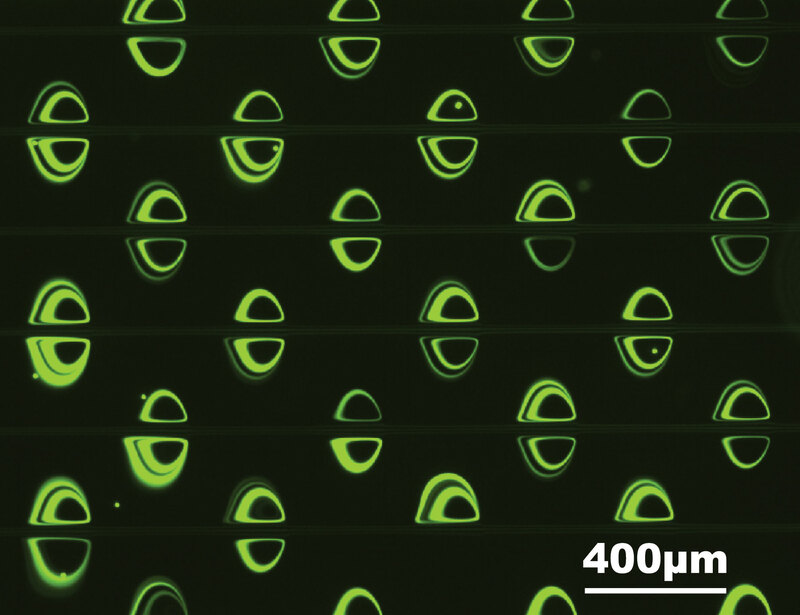 Our lab focuses on developing innovative microfluidic techniques for sheathless particle positioning, cellular biophysical property measurements and label-free target cell purification. Inertial Focusing is a unique microscale hydrodynamic phenomenon, which can be utilized to accomplish aforementioned purposes. 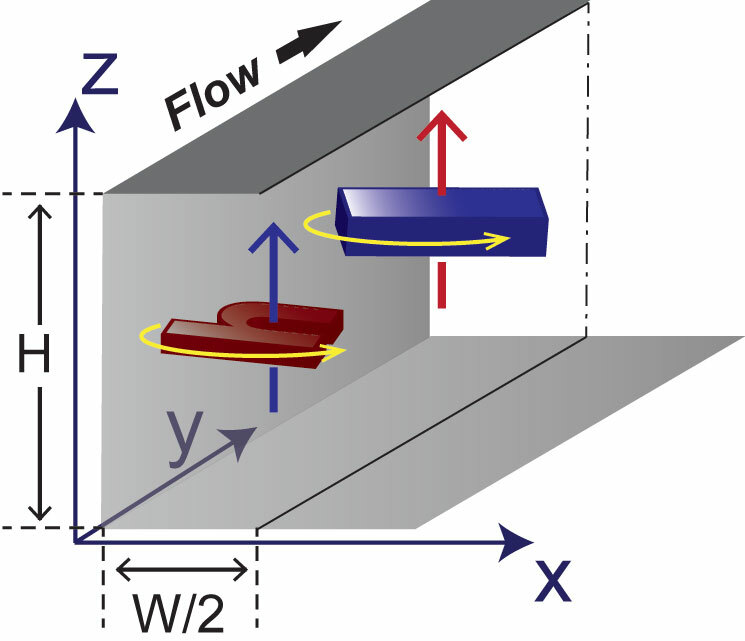 By fine-tuning microchannel geometries and flow conditions, the lateral location of flowing particles with a wide range of varying sizes, mechanical stiffnesses and shapes, can be precisely controlled. We envision that Inertial Microfluidics will enable development of simple and cost effective target cell identifcation/purification techniques, which will have beneficial impact for numerous clinical and research applications. Massively parallel inertial focusing for imaging flow cytometry. Illustration by Marc Lim . Orientation of inertially focused nonspherical disks and cylinders. Particles were fabricated by BiNEL. Mechanical properties of flowing particles can be reflected in lateral dynamic equilibrium positions, Xeq. In addition to nonlinearity associated with the inertia of the fluid, nonlinear lateral migration can occur when the particle itself is deformable. Lateral migration of deformable particles was found to result from a nonlinearity caused by matching of velocities and stresses at the particle/droplet interface. That is, the magnitude of lateral drift velocity and lift force is closely related to the deformed shape of the object. The fact that deformable particles experience an additional lift force suggests the possibility of high throughput deformability-induced particle classification and separation. Deformation-induced lift forces will act in superposition with inertial lift forces to create modified lateral equilibrium positions that are dependent on particle deformability. 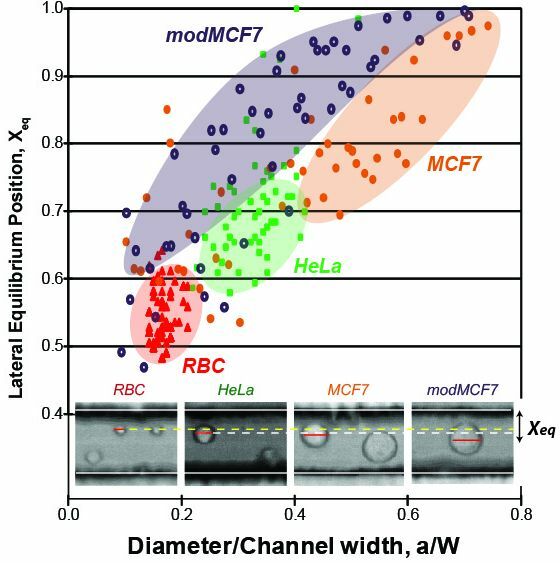 Lateral dynamic equilibrium positions vary depending on cellular biophysical properties. The fact that deformable particles experience an additional lift force suggests the possibility of high throughput deformability-induced particle classification and separation. Deformation-induced lift forces will act in superposition with inertial lift forces to create modified lateral equilibrium positions that are dependent on particle deformability. 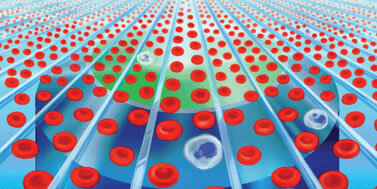 High-throughput purification of selected target cells using inertial microfluidics apears to be feasible.